When you watch tennis, or any other sport, you're watching a demonstration of physics, just with more cheering than the typical physics experiment. Central to the action are the three laws of motion described in 1687 by Sir Isaac Newton, the Grand Slam champ of pre-industrial science. 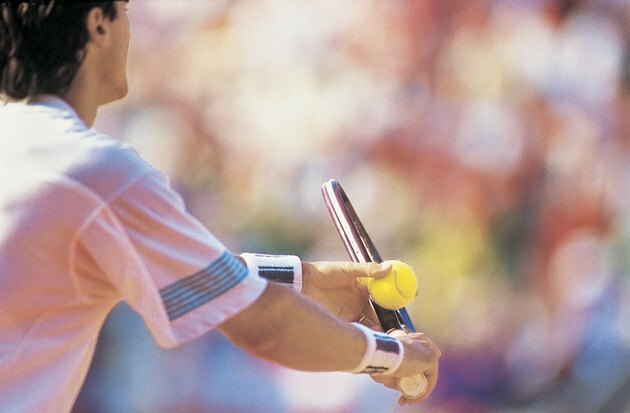 In many ways, a tennis match is a test of which player manipulates Newton's laws to greatest effect. Newton's first law of motion is commonly called the law of inertia: An object in a state of uniform motion will remain in that motion unless it encounters an external force, and an object at rest will remain at rest unless it is acted upon by an external force. Newton's second law defines the relationship between an object's mass, the force applied to it and the acceleration that results: Force equals mass times acceleration, or F=ma. Newton's third law of motion might be the one that most people are most familiar with, if only because they see it quoted so often: For every action there is an equal and opposite reaction. In tennis, the most obvious instance of Newton's first law is the path of the ball. When you smack the ball with your racket, it heads off in a certain direction. If you were playing the game in the vacuum of intergalactic space, light years from any gravity-producing body, the ball would continue in that direction more or less indefinitely, because no external forces would be acting on it. On Earth, however, two major forces are at work: Air resistance slows the speed of the ball and gravity pulls the ball toward the ground. When you thwacked that tennis ball with your racket -- in space or on Earth -- you exerted a force on it. How much force? That's where Newton's second law comes in: Force equals mass times acceleration. In this equation, mass is measured in kilograms and acceleration in a unit called "meters per second per second." Acceleration isn't the same thing as speed; rather, it's the rate at which something is speeding up. If an object is moving at 1 m per second, or "m/s," and it speeds up so that one second later it's moving at 2 m/s, then it sped up 1 m/s in that one second -- 1 m per second per second. Now back to that tennis ball you hit: A tennis ball has a mass of about 56 g, or 0.056 kg. And let's say that you put enough zing on the ball that one-tenth of a second after you hit it, it reaches 100 mph, or 44.7 m per second. That's a rate of acceleration of 447 m per second per second, or m/s/s. Multiply 0.056 kg times 447 m/s/s and you get 25.032. But 25.032 of what? Force is measured in units called, appropriately enough, Newtons. You hit the ball with 25.032 Newtons of force. Nice serve. You serve the ball, your opponent returns the serve and you go to return her volley. You plant your foot on the ground and push off. You push in one direction -- at an angle into the ground -- and your body goes in the opposite direction, at an angle away from the ground. The force with which you pushed into the ground is the force with which you're propelled forward. That's action and reaction. You're Newton's third law of motion, in motion.